We have a couple of LCD screens available. If you can get one, hook it up to your Arduino board as shown below. 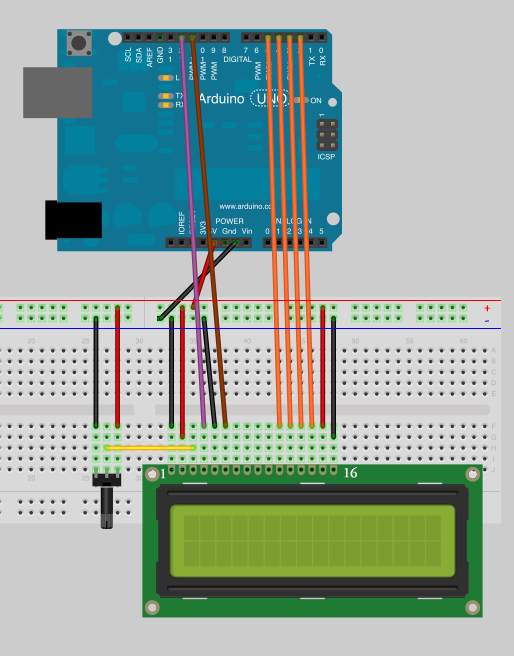 Then, in the Arduino software, open File -> Examples -> LiquidCrystal -> HelloWorld and upload it to the board to see if you can write text to the LCD. Note that in the above picture, I labelled pins 1 and 16. These labels are NOT on the actual lcd board. Some of you may also have boards that have 18 pins. For those boards, pins 16, 17 and 18 are for different backlight colors that you can mix to make a different background color. Pin 16 is red, pin 17 is green and pin 18 is blue.